The Model T Ford Rear Axle was one of the first successful developments in drawing steel to components of its size. The ability to do so enabled Henry Ford to produce a rear axle housing that was simple yet strong and primarily a 2 piece bolt together housing, with the other component pieces, permanently riveted together. The axles support the entire weight of the rear of the car at their outer extremities, just before the axle tapers. The axles are supported by long roller bearing assemblies, running in hardened steel shells that are inserted inside the housings. At the "business end" the axle tapers have a key way cut into the axle and with a steel key fitted, the wheels lock onto the axle on this key, and are then tightened onto the axle taper with the axle nut. 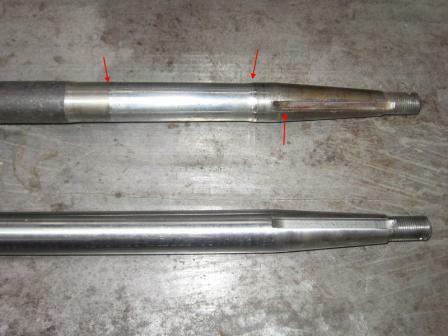 In the following picture, a comparison is made between a well worn axle and a brand new reproduction axle. Note the wear as indicated by the arrows. The keyway is just starting to "flog" out on the edge. In some instances, I have seen enough here as a result of worn tapers (from loose wheels) that the key has been able to roll over on its edge in the keyway and cause extensive damage. The Model T Ford Differential (also known as the diff) features a crown wheel & pinion arrangement of straight cut gears driving the axles. The standard ratio of 3.63:1 has been supplemented by the availability of a higher ratio of 3:1. This higher ratio has enabled modern day Model T drivers to achieve approximately 7 mph more from the same engine speeds. 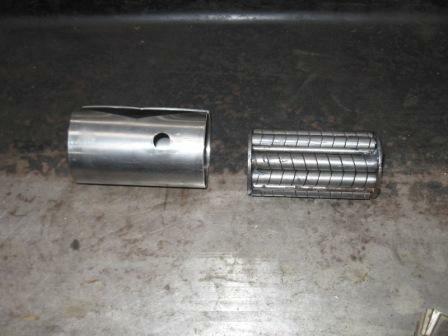 The following images show the disassembly of the Model T Ford rear axle. 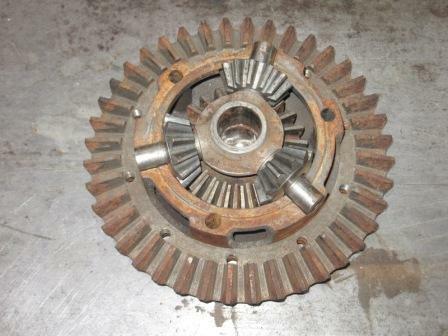 This particular axle was recovered from an abandoned "paddock relic". Another Model T left in an old farm paddock to slowly rot away. We had, with a little bit of effort managed to get the engine to fire up a few weeks ago, and with the remains of the car stored away for a rebuild one day, the rear axle was removed to, for the short term, keep another vehicle on the road. 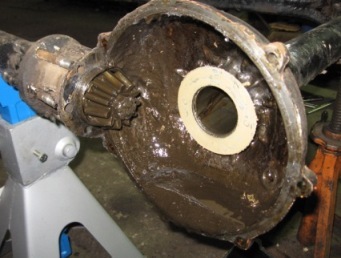 Typically, this is what you'll encounter in most unrestored rear axles. With the assembly removed from the car and supported on stands, the first task was to drain the oil. With not a drop coming out, the next move to to remove the radius rods so the differential housing could be split. Remove the split pin and axle nut, then using a hub puller, remove the rear wheel. Typically, as we found, the thread on the wheel hub wasn't terrific and on one side we had to use a thread chaser to clean it up. This is necessary because the hub puller screws onto this thread. With one wheel off, the diff housing bolts were removed and half the cotton reel bolts undone. This enables you to remove the housing on one side for inspection. As soon as the housing is apart, in this case, a number of points become clear. 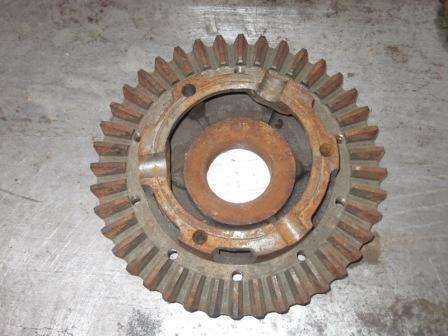 We found that both the inner and outer bearings were in relatively good condition. 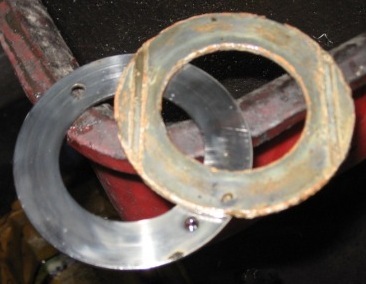 The outer bearing sleeve however was not. There was that much wear on the very outer edge that it was not possible to insert the sleeve pulling tool with filing off the edge that had worn up. You'll also notice some 80 years worth of sludge that has built up in the bottom of the casing, in this case nearly 2 inches thick. The two photo's above show damage to the axle. 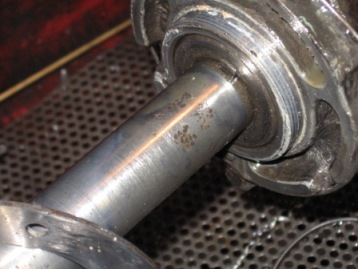 The first shows where the case hardening of the axle is starting to wear through. 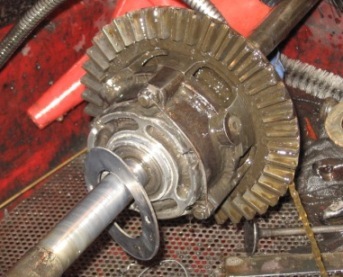 The second photo shows two important things, pitting of the axle as well as trouble with the key. If you look closely, you notice that the axle gear key is sticking out proud of the back of the gear. 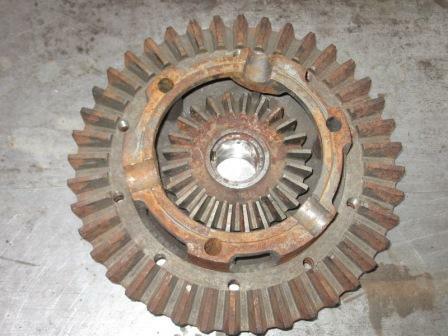 This has been wearing on the end of the inner bearing casing. 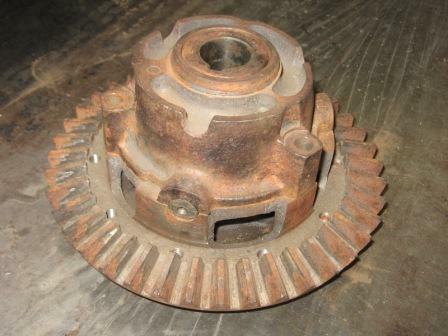 To completely remove the diff and axle assembly, the other wheel and axle nut were removed and the whole assembly withdrawn from the other housing. All components are then taken to be cleaned. A word of warning! When disassembling and cleaning your rear axle, you are likely to find these babbitt thrust washers. In this case, they are in pretty good condition. I STRONGLY recommend that you do not be tempted to reuse them. 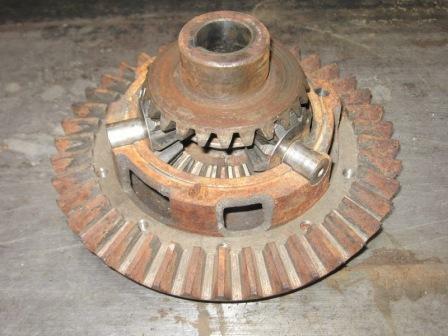 Although the babbitt in many cases has served a long and useful life, it is prone to break up with age and WILL cause premature failure of a rebuilt differential. A modern brass equivalent is now available from the spare parts suppliers and provides a hard wearing modern alternative.